Three days ago, British Prime Minister Theresa May has declared that former Russian military's Main Intelligence Directorate (GRU) Colonel Sergei Skripal and his daughter were poisoned with a nerve agent called Novichok. In 2004, Russia’s Federal Security Service (FSB) arrested Skripal and later on, he was sentenced to 13 years in prison for high treason. In 2010, the former colonel was handed over to the U.S. as part of a swap involving espionage suspects. Later in the same year, Skripal arrived in the U.K. and settled there. According to reports, Novichok is a class of military-grade nerve agents developed by the Soviet Union at the end of the Cold War. It was only ever manufactured at one site, a military laboratory at Shikhany in central Russia. However, according to the Organization for the Prohibition of Chemical Weapons (OPCW), there is no record of Novichok nerve agents having been declared by any nation that signed the Chemical Weapons Convention. Some in Russia have suggested that the nerve agent could have come from another former Soviet country. 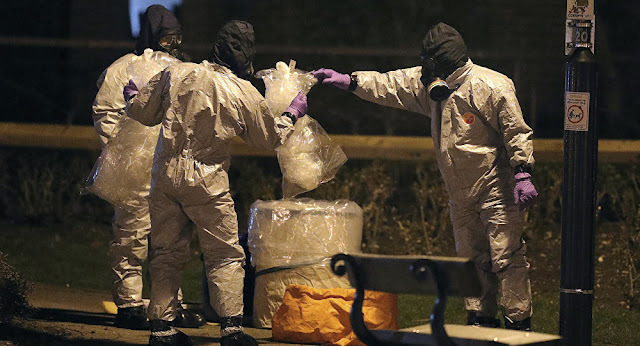 Politician Vladimir Gutenev, a member of Russia's state commission for chemical disarmament, said Russia had scrapped its stockpile of Novichok. "It is hard to say what may be happening in neighboring countries," he was quoted as saying by the Interfax news agency. On March 4, 2018, Russian ex-spy Sergei Skripal, 66, and his daughter Yulia Skripal, 33, got critically ill after they were found unconscious on a bench in the Wiltshire city. There is much mystery about how exactly the brazen attack was carried out. On March 13, 2018, Russia’s Foreign Ministry has sternly warned Britain against shutting the office of RT television, saying it will lead to the closure of British media’s bureaus in Moscow. There is an on-going speculation, that Russian state-funded Russia Today (RT) television network could be stripped of its broadcasting license in the U.K. in the wake of the nerve agent attack. The ministry spokeswoman, Maria Zakharova, said in televised remarks that "not a single British media outlet will be able to work in our country if they close RT." On March 14, 2018, U.K.'s Prime Minister Theresa May announced that the country is expelling 23 Russian diplomats as a retaliation. It's the single biggest expulsion since the Cold War. She said the diplomats, who have a week to leave, were identified as "undeclared intelligence officers". However, Russia denies attempted murder and says it will respond appropriately. On March 15, 2018, U.K blocked a Russia-initiated United Nations Security Council statement on the incident of poisoning. According to reports, the Russia-initiated draft press statement consisted of two sentences. It expressed its concern over reports about the supposed use of a nerve agent in the U.K. and called on all parties concerned to cooperate in the investigation of this incident in conformity with their liabilities under the Chemical Weapons Convention. On March 16, 2018, British Foreign Secretary Boris Johnson claimed the Russian president likely ordered the attack. Johnson’s comments followed Prime Minister Theresa May’s decision Wednesday to expel 23 Russian diplomats from Britain. Russia denies involvement and said the accusations against Putin were "shocking and unforgivable". On March 16, 2018, Vil Mirzayanov, 83, the Russian chemist who revealed the existence of the Novichok family of chemical agents to the world has dismissed the notion that a non-state actor could be behind the poisoning. He said the chemical was too dangerous for anyone but a "high-level senior scientist" to handle and that even he – who worked for 30 years inside the secret military installation where Novichok was developed and gained extensive personal experience in handling the agent – would not know how to weaponize it. On March 17, 2018, Russia ordered the expulsion of 23 British Diplomats in counter-retaliation. The British ambassador Laurie Bristow was summoned for talks with the Russian foreign ministry on Saturday, and Moscow has said the U.K. diplomats must leave the country within one week. It also said it would close the British Council in Russia, which promotes cultural ties between the nations, and the British Consulate in St. Petersburg. The council's activity here had already been significantly curtailed by Moscow after the last crisis in relations when Alexander Litvinenko was poisoned. A day earlier, Russia had confirmed it will expel British diplomats and halt high-level meetings in turn. In a rare joint statement issued on March 15, 2018, British Prime Minister Theresa May and U.S. President Donald Trump, French President Emmanuel Macron and German Chancellor Angela Merkel said: "there is no plausible alternative explanation" to Russian responsibility for the poisoning. "This use of a military-grade nerve agent, of a type developed by Russia, constitutes the first offensive use of a nerve agent in Europe since the Second World War," the leaders said, calling it "an assault on U.K. sovereignty" and "a breach of international law." The statement from the White House said: "The United States stands in solidarity with its closest ally, the United Kingdom." "The United States shares the United Kingdom's assessment that Russia is responsible for the reckless nerve agent attack on a British citizen and his daughter, and we support the United Kingdom's decision to expel Russian diplomats as a just response." Earlier on March 14, 2018, Germany’s Foreign Minister Sigmar Gabriel said: "We condemn this attack with a banned chemical weapon in the strongest possible terms." "It is clear that the perpetrators must be brought to justice. If it is confirmed that Russia is behind this, then this would be a very serious matter indeed." China's UN ambassador, Ma Zhaoxu, called for an "impartial investigation based on facts". He added: "We hope the relevant parties properly handle this issue through appropriate channels." The Australian high commissioner to the U.K., Alexander Downer, has stated his country is "right behind" the U.K. over the "Russian outrage"